Just over three weeks ago I received a call from the vet I used to work for,(I'm a retired tech). 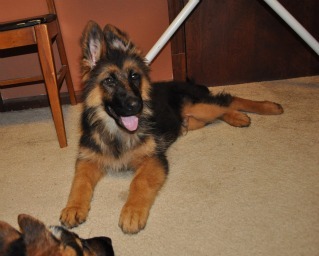 He said someone had dumped 2 pups and he knew I was looking around for a German Shepherd, would I be interested? Of course I was there in a flash. The pups were 2 GS boys about 4 months old. No question, they were going home with me! The vet checked them, vaccinated, micro chipped and neutered them. They have been home with me for 2 weeks, we have started training classes and they are the best pups ever!! 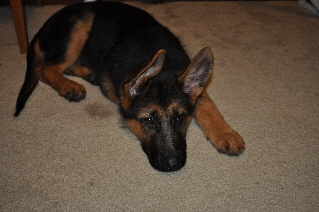 I am crate training them and in the time they have been with me, there has been only 1 wet accident. They are so loving, loyal and receptive to training. I don't care about papers or bloodlines, even though I am curious about their history(which I will never know). I got so lucky because someone was stupid enough to dump them, but smart enough to dump them at my vet. Hello Barbara. 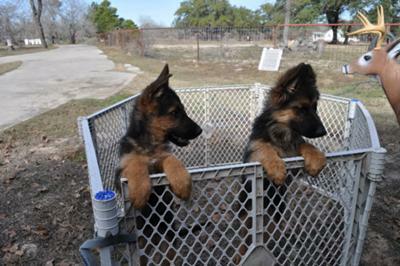 Thank you so much for taking the time to share your own personal German Shepherd story and picture of your beautiful German Shepherd puppies Thor and Zues with us. And what great pictures of those two little guys too. They look so happy now. Beautiful story. Nicely done - they are both so cute! Hi Barbara...such a nice blessings you have.. Wish someone would also do that for me here in the Philippines..Goodluck and enjoy your new companions.